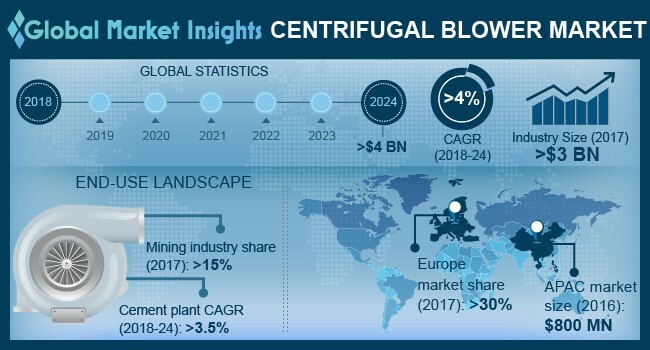 Centrifugal Blower Market size is forecast to exceed USD 4 billion by 2024; according to a new research report by Global Market Insights, Inc.
Strong product demand from mining industry in the U.S. will have subsequent impact on the centrifugal blower market size by 2024. High pressure centrifugal blowers are broadly used for ventilation, cooling or exhaust gas system in mining industry. It helps in blowing the air into ducts, tunnels, and underground passages. U.S. mining industry is widely engaged in mining coal, metals (zinc, copper, iron, etc. ), industrial minerals (potash, limestone and crushed rocks). Additionally, U.S. is among the second leading coal producer which accounts for 17% of the total world’s production which is valued more than 1 billion tons. The above-mentioned trends will drive product demand which will help make notable contribution to the centrifugal blower market size by 2024. Significantly high cost of production and servicing cost of product is probable to hamper the overall centrifugal blower market size in the forecast timespan. However, higher investment by major players in their R&D facilities will help attain energy efficiency and low-cost equipment in the near future. These trends are likely to generate ample opportunities for centrifugal blower market size by 2024. Low pressure centrifugal blower market size was valued over USD 600 million in 2017, which is anticipated to witness moderate gains by 2024. Low pressure centrifugal blower generate pressure up to 8,000 Pa. They are usually constructed using mild stainless steel and can use variety of blades including radial blade, radial tipped, backward curved, inclined or air flow blades. They are usually used when high air flow with low pressure is required. For instance, they are applicable across power stations, textile industry, etc. In power stations, they are used for supplying air for fuel combustion and maintenance of furnace temperature. Centrifugal blower market share for cement plant is projected to witness gains of more than 3.5% by 2024. These equipment are used for removing waste gases and re-circulating air in the cement plants. Moreover, they are used in the blending and storage area, conveying raw materials, additives, and chemicals used in the cement manufacturing gases. These equipment are usually used to transport hot gases from cement kilns. Strong rise in construction industry mainly in Asia Pacific and the Middle East which is due to high investment in infrastructure projects by the regional government to help boost economy in the region. These trends will have subsequent impact on product demand, which will help attain considerable gains to centrifugal blower market size by 2024. Asia Pacific centrifugal blower market size was close to USD 800 million in 2016. Strong product demand from cement plant, steel plants, power stations, food, textile and mining industry will help generate considerable gains to centrifugal blower market size during the forecast timeframe. Growing economy in the region has a subsequent impact on the power industry to meet the rising electricity demand from industrial and household sector. Additionally, rapid urbanization & industrialization has triggered product demand across cement and steel plants, which will have positive impact on the centrifugal blower market size by 2024. The key centrifugal blower market players are KAESER KOMPRESSOREN, Aerotech Equipments and Projects, Atlas Copco, Airmake Cooling Systems, HSI Blower, Howden and GP Motors. Some of these players are investing heavily to expand its product landscape, in order to achieve an edge over its competitors. For instance, Howden announced its line of turbo pressure blower which are ideal for high pressure systems for pollution control, air combustion, etc., in chemical, pulp & paper, glass and food processing applications.